On Sale Now! Save 9% on the Morton Safe-T-Salt Rock Salt 25.0 LB For Snow And Ice Removal by Morton at The Mirror Project. MPN: 706014. Hurry! Limited time offer. Offer valid only while supplies last. Morton Safe-T-Salt is America's #1 brand of rock salt. Salt has been used for decades to help control ice and snow when winter weather strikes. 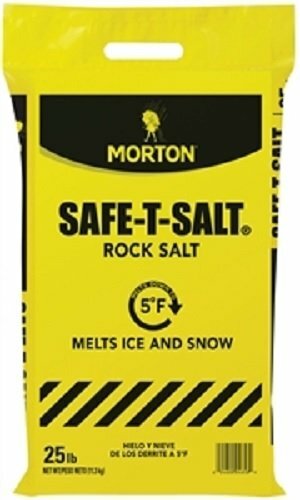 Morton Safe-T-Salt is America's #1 brand of rock salt. Salt has been used for decades to help control ice and snow when winter weather strikes. Morton Safe-T-Salt provides a tried-and-true melting solution at lower cost than most specialty melters.